SUMMARY PAGE. For 280 photos of building disaster, click on pages, above. Saving our new Rutherford Custom Home — Deconstruction / Reconstruction. Constructing a beautifully designed home to blend in with stone and trees in the Texas Hill Country was a dream. We lived hundreds of miles away, and as our dream neared reality, it began fading as the builders were 5 months late, and they had a long, unfinished To Do list. Eight months after move-in, we could not use our kitchen or office as all cabinets, drawers, and work areas were cleaned out for painters. They were repainting what two separate paint store managers said was too little paint for the surfaces — thin, latex paint, the wrong paint for wood work surfaces, which easily scraped off. Worse, the then-historic Texas drought broke and our first light rains brought in water from the roof, from about 15 windows, and around and through doors. The wood floor was warping and cupping. Our builders were no help. After months of being unwilling or unable to fix the urgent and mounting problems, we terminated Rutherford Custom Homes of Wimberley, TX. We needed capable help, fast. This website’s pages offer a glimpse of what we had to endure to turn our Rutherford Custom Home sieve into a livable residence. We had to deconstruct our new home, then reconstruct it using proper building practices and materials. We found plenty of good contractors and skilled workers who helped us through the dark days. The following items are a brief description of the trouble we faced. They summerize each of the pages of this website. Each of these website pages has multiple photos, many taken during construction and after the rains came. 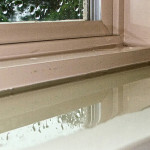 How could we build water-tight windows when our builder couldn’t? Beau Rutherford was president of this construction company. His father Jim Rutherford touted himself as having 40 years of building experience, and according to Beau Rutherford, Jim Rutherford served as RCH paid consultant. However, Rutherford Custom Homes was unable to build our home with windows that wouldn’t leak, specifically 28 leaking windows. This, despite explicit directions. Worse, after the then-historic drought ended and rain came through 15 windows in the first two light rains, our builders did not stop even 1 window leak over the next 3 1/2 months. From installation to painting, it took Rutherford Custom Homes 9 months to apply the green exterior door paint. They were installed, unsealed, outside for months. 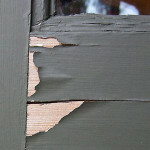 In between installation and painting, the unsealed doors absorbed moisture, and after paint was applied, it quickly began to crack, bubble, flake, and fall off. When the drought broke, rain came in around the doors — and through the doors. Who would have thought it would take a plumber and a carpenter to stop leaks? That’s what it took many times in our Rutherford Custom Homes of Wimberley, TX. Beau Rutherford’s plumber buried connectors inside walls and neither Beau (James W. Rutherford Jr.) nor Jim Rutherford corrected his work. When the plumbing leaked, a carpenter had to cut open large sections of wall to get to the connector and to dry out the framing. This entry was posted in Uncategorized by ourdreamWPadmin. Bookmark the permalink.